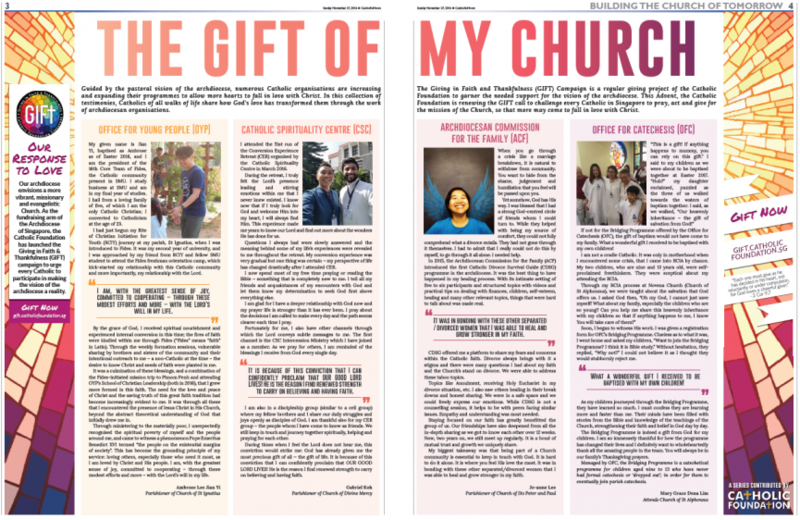 Guided by the pastoral vision of the archdiocese, numerous Catholic organisations are increasing and expanding their programmes to allow more hearts to fall in love with Christ. In this collection of testimonies, Catholics of all walks of life share how God’s love has transformed them through the work of archdiocesan organisations. My given name is Jian Yi, baptised as Ambrose as of Easter 2016, and I am the president of the 16th Core Team of Fides, the Catholic community present in SMU. I study business at SMU and am in my final year of studies. I hail from a loving family of five, of which I am the only Catholic Christian; I converted to Catholicism at the age of 23. I had just begun my Rite of Christian Initiation for Youth (RCIY) journey at my parish, St Ignatius, when I was introduced to Fides. 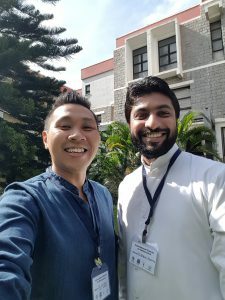 It was my second year of university, and I was approached by my friend from RCIY and fellow SMU student to attend the Fides freshman orientation camp, which kick-started my relationship with this Catholic community and more importantly, my relationship with the Lord. By the grace of God, I received spiritual nourishment and experienced internal conversion in this time; the fires of faith were kindled within me through Fides (“Fides” means “faith” in Latin). Through the weekly formation sessions, vulnerable sharing by brothers and sisters of the community and their intentional outreach to me – a non-Catholic at the time – the desire to know Christ and seeds of faith were planted in me. 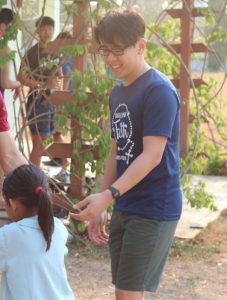 It was a culmination of these blessings, and a combination of the Fides-initiated mission trip to Phnom Penh and attending OYP’s School of Christian Leadership (both in 2016), that I grew more formed in this faith. The need for the love and peace of Christ and the saving truth of this great faith tradition had become increasingly evident to me. It was through all these that I encountered the presence of Jesus Christ in His Church, beyond the abstract theoretical understanding of God that initially drew me in. Through ministering to the materially poor, I unexpectedly recognised the spiritual poverty of myself and the people around me, and came to witness a phenomenon Pope Emeritus Benedict XVI termed “the people on the existential margins of society”. This has become the grounding principle of my service: loving others, especially those who need it most, as I am loved by Christ and His people. I am, with the greatest sense of joy, committed to cooperating – through these modest efforts and more – with the Lord’s will in my life. I attended the 51st run of the Conversion Experience Retreat (CER) organised by the Catholic Spirituality Centre in March 2016. During the retreat, I truly felt the Lord’s presence leading and stirring emotions within me that I never knew existed. I know now that if I truly look for God and welcome Him into my heart, I will always find Him. This experience made me yearn to know our Lord and find out more about the wonders He has done for us. Questions I always had were slowly answered and the meaning behind some of my life’s experiences were revealed to me throughout the retreat. My conversion experience was very gradual but one thing was certain – my perspective of life has changed drastically after I attended CER. I now spend most of my free time praying or reading the Bible – something that is completely new to me. I tell all my friends and acquaintances of my encounters with God and let them know my determination to seek God first above everything else. I am glad for I have a deeper relationship with God now and my prayer life is stronger than it has ever been. I pray about the decisions I am called to make every day and the path seems clearer each time I pray. Fortunately for me, I also have other channels through which the Lord conveys subtle messages to me. The first channel is the CSC Intercession Ministry which I have joined as a member. As we pray for others, I am reminded of the blessings I receive from God every single day. I am also in a discipleship group (similar to a cell group) where my fellow brothers and I share our daily struggles and joys openly as disciples of God. I am thankful also for my CER group – the people whom I have come to know as friends. We still keep in touch and journey together spiritually, helping and praying for each other. During times when I feel the Lord does not hear me, this conviction would strike me: God has already given me the most precious gift of all — the gift of life. It is because of this conviction that I can confidently proclaim that OUR GOOD LORD LIVES! He is the reason I find renewed strength to carry on believing and having faith. When you go through a crisis like a marriage breakdown, it is natural to withdraw from community. You want to hide from the shame, judgement and humiliation that you feel will be passed upon you. Yet somehow, God has His way. I was blessed that I had a strong God-centred circle of friends whom I could turn to. While they helped with being my source of comfort, they could not fully comprehend what a divorce entails. They had not gone through it themselves. I had to admit that I really could not do this by myself, to go through it all alone. I needed help. In 2015, the Archdiocesan Commission for the Family (ACF) introduced the first Catholic Divorce Survival Guide (CDSG) programme in the archdiocese. It was the best thing to have happened in my healing process. With its intimate setting of five to six participants and structured topics with videos and practical tips on dealing with finances, children, self-esteem, healing and many other relevant topics, things that were hard to talk about was made real. CDSG offered me a platform to share my fears and concerns within the Catholic faith. Divorce always brings with it a stigma and there were many questions I had about my faith and the Church’s stand on divorce. We were able to address these taboo topics. Topics like Annulment, receiving Holy Eucharist in my divorce situation, etc. I also saw others healing in their break downs and honest sharing. We were in a safe space and we could freely express our emotions. 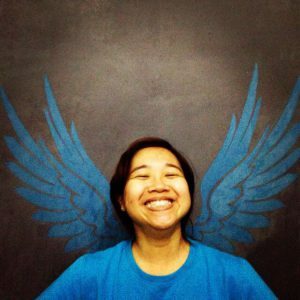 While CDSG is not a counselling session, it helps to be with peers facing similar issues. Empathy and understanding was most needed. Staying focused on our faith has greatly benefitted the group of us. Our friendships have also deepened from all the in-depth sharing as we got to know each other over 12 weeks. Now, two years on, we still meet up regularly. It is a bond of mutual trust and growth we uniquely share. My biggest takeaway was that being part of a Church community is essential to keep in touch with God. It is hard to do it alone. It is where you feel His love the most. It was in bonding with these other separated/divorced women that I was able to heal and grow stronger in my faith. If not for the Bridging Programme offered by the Office for Catechesis (OFC), the gift of baptism would not have come to my family. What a wonderful gift I received to be baptised with my own children! I am not a cradle Catholic. 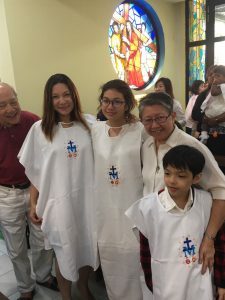 It was only in motherhood when I encountered some crisis, that I came into RCIA by chance. My two children, who are nine and 13 years old, were self-proclaimed freethinkers. They were sceptical about my attending the RCIA. Soon, I began to witness His work. I was given a registration form for OFC’s Bridging Programme. Clueless as to what it was, I went home and asked my children, “Want to join the Bridging Programme? I think it is Bible study.” Without hesitation, they replied, “Why not?” I could not believe it as I thought they would stubbornly reject me. As my children journeyed through the Bridging Programme, they have learned so much. I must confess they are learning more and faster than me. Their minds have been filled with stories from the Bible and knowledge of the teachings of the Church, strengthening their faith and belief in God day by day. The Bridging Programme is indeed a gift from God for my children. I am so immensely thankful for how the programme has changed their lives and I definitely want to wholeheartedly thank all the amazing people in the team. You will always be in our family’s Thanksgiving prayers. Managed by OFC, the Bridging Programme is a catechetical programme for children aged nine to 13 who have never had formal catechesis or ‘dropped out’; in order for them to eventually join parish catechesis.